Model 1351 is NOVA’s second-generation Military Grade monochrome laser printer. 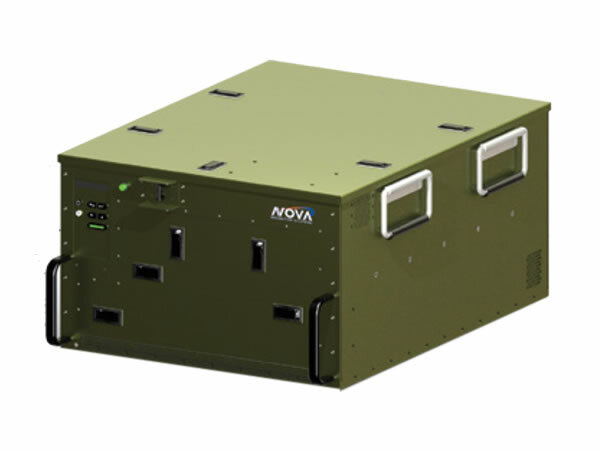 Selected by military land forces, the 1351 continues NOVA’s tradition of providing a battlefield-ready printer meeting MIL-STD-461 (EMI/EMC), MIL-STD-704 (transients) and MIL-STD-810 for shock, transportation, bench handling, vibration, crash acceleration, explosive atmosphere, sand and dust, temperature, altitude and humidity. Built around Brother’s HL-L2360DW engine, the 1351 adds features from its predecessor such as faster print speed, upgraded USB port, built-in Ethernet port, 2400 x 600 dpi effective print output, lower power consumption, front panel status indicator LEDs, and easy to use front panel controls. Toner and drum consumables used in the 1351 are standard Brother replacements. Paper ingress is handled elegantly through a sealed, hinged access door on the front of the printer housing. Paper egress is accessed from the hinged top cover or the front door held tight with quarter turn latches. Available options include 220 VAC or 18-36 VDC input power via external military grade inverter provided by parent company Technology Dynamics, Inc. (www.technologydynamicsinc.com). Standard mounting configurations include tabletop, 19” rackmount or ARINC style shock tray recommended for vehicle and other high shock applications. This upgraded unit includes an EMI filter provided by sister division Nova Electric (www.novaelectric.com), Steel-coil isolators, optional heater and ability to mount on an external ARINC mounting tray. This unit is also further protected from the elements by conformal coating of PCBs and further ruggedization of the print engine. Rapid decompression MIL-STD-810F, Method 500.4, Procedure III from 8,000 ft. up to 41,000 ft. in 15 sec.